The Algarve is one of the most spectacular holiday destinations in Europe. The staggeringly breathtaking cliffs contrast with the golden sands of some of the best beaches in the world. A holiday on the Algarve offers a multitude of attractions and excursions for the whole family. Whether you are spending the day lazing on the beach or exploring the local attractions, the Algarve has it all. 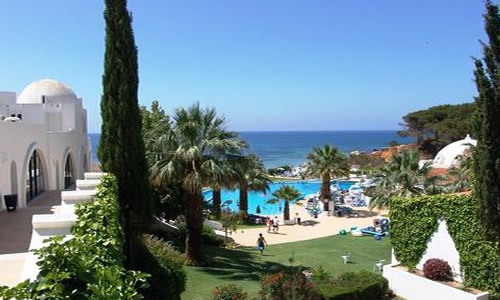 The Oura View Beach Club has arguably the best spot on the Algarve. Situated right on the beachfront, the resort has magnificent views and vistas of the Atlantic Ocean that cannot be matched. The immaculate grounds and sparkling swimming pool are a fitting backdrop for this premier establishment. Oura View Beach Club offers a combination of studio as well as one and two bedroom units. The décor is stylish and modern with a local dash of colour and culture. Each of the fully outfitted apartments includes air conditioning as well as satellite TV and an entertainment centre. The full kitchens have designer marble work units and luxurious extras like a dishwasher for your convenience. Amenities onsite include a full gymnasium and leisure centre. The resort is in close proximity to some of the best golf courses in Europe. It's an easy drive to over 20 excellent golf courses on the Algarve. The Oura View Beach Club is a perfect location for a family holiday or romantic getaway for two. The beaches that gleam in the soft sunlight and the pristine waters of the Atlantic make for a fabulous day out. The beachfront at Oura has a number of excellent eateries and casual bistros for light meals and the town of Albufeira is just a couple of kilometers away from the resort if you're looking for a bit of excitement after the sun goes down. A highlight of a trip to Oura View Beach Club is to experience the thrill of a 'Jeep Safari'. You can make enquiries about this at the resort.